I don’t think I would have seen this one if I wasn’t reading CNET, where I learnt that Windows Live Hotmail now includes Web Messenger. 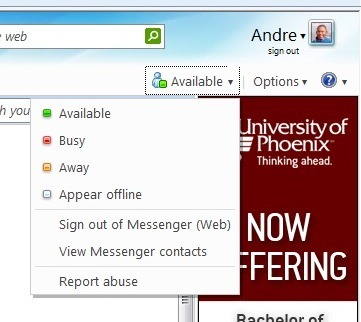 Prior to this new functionality, users accessed MSN Web Messenger by going to http://webmessenger.msn.com. Now you can access it right from within the Windows Live Mail web page beside the Options link. Once signed in, you can manage your status and start communicating with your contacts. The only bummer is, it changes the Hotmail page to your Live Contacts, I would appreciate if it had opened this in a different window or tab. You can start a conversation from within the People contact list pop out menu. Web Messenger even provides toast messages. Its quite basic as the previous MSN Web Messenger, but for persons who want just the fundamentals, especially at work, its a definite plus. I would have liked if could maintain the Messenger like contact window experience. I notice that working with it in Internet Explorer 8 on Windows 7 causes some problems, I tried ungrouping the conversation window, but it refused, will try it a little later on Vista to see if its same. Its good that its utilizing the People contact list, but I don’t like the idea it automatically changes the Windows Live Hotmail page without the users consent. 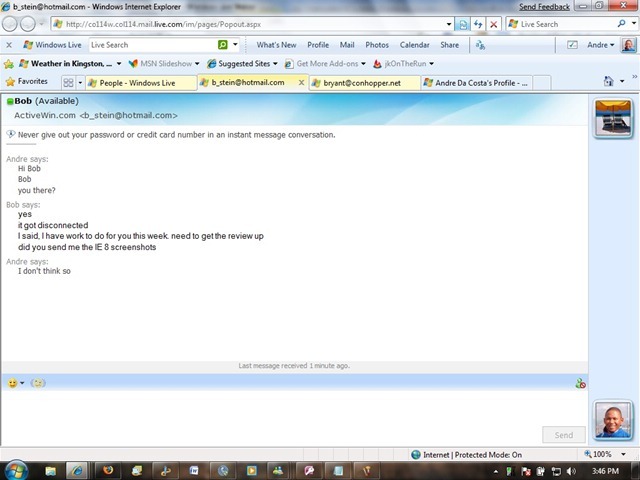 Windows Live Hotmail – New Improvements!